Some great practical advice! If you're like me, I spend the majority of my time "away" from the house, so having your vehicle prepared is the smart thing to do. Agreed! Thanks for checking out my blog! Rightwingdad says the practice of topping of your gas tank when it's half full can result in stale gas. This can be harmful to the engine. Of course I always get nervous when my tank gets low. I just KNOW that's when the SHTF will happen! I've purchase several bottles of Sta-Bil gas stabilizer at Walmart. Pour it in your red gas cans and fill them up. The gas will last over a year. I haven't heard that before, but I'll check it out. If you can keep it in containers for months at a time, even without Stabil, why can't you do that in your tank when the old mixes with the new? My guess is rightwingdad is worried there would always be a portion of old gas remaining in your tank. The first top off – 50%, the second 25%, the third 12.5%, etc. Then the top off would degrade too, just at a week interval, as it wouldn't be fully used. So, if you filled up every week the average age of the "old" gas would be approximately 4 weeks old with less than 1% over 8 weeks. Personally I don't think that's old enough to hurt, but I'm not a mechanic. We're in an hurricane zone. It's a habit to fill several 5 gal. cans w/ gas and allow them to sit in the garage for up to 6 months. We use it for our generator. I like to fill them and forget about them, but that's just me. You could rotate the cans and use them in your vehicle; they're just very heavy to lift. Nothing to worry about if you're driving the car frequently. Gas takes a while to break down. The fresh gas also contains stabilizers that can extend the remainder in your tank. As a former ASE Master Mechanic (now an insurance inspector) I can confidently say that stale gas is more of a myth than a fact. If the car is going to sit for more than 90 days, give the tank a dose of sta-bil and run the engine long enough to circulate the solution. The only cars I ever saw with problems from bad gas had been sitting for over six months in high heat and high humidity. Wow, what a timely article. I have just finished putting together car kits, and yes it was a pain. I have added items not for emergencies but that we need regularly and forget often (sun screen, bug spray, diapers) as well as the requisite jumper cables, tools, duct tape, etc. It turned out to be a pretty long list, but it all stowed pretty well. Would add a few quarters to your cash stash — I have had to pull out to use air for tires (it's never free) and tolls. Oh, one other thing — would recommend stashing a list of games that don't require any items to play with your cards. You'd be surprised how many you know when you read the list, but sometimes it's hard to remember in a stress situation. What a great site! Thanks!! I'm printing it out now and will store a copy in my vehicle 72 Hour Kit. A lot of us moms practically LIVE in our vehicles, so it makes a lot of sense to equip them for emergencies, even if it's just getting stuck at the DMV for several hours. Those who have read or seen Hitchhiker's Guide to the Galaxy know that towels are infinitely useful. We bought an extra large beach towel (as tall as me) for each of our cars. We should have two per car, but we haven't gotten around to it yet. It's amazing the things you can use it for. We've used them as blankets when we went to a recent concert with lawn seats, we've toweled off after swimming, we kept warm when camping. You name it, your towel can do it. Right after a bandana, it's my second favorite car kit item. The beach towel is a great idea. Seems that it would have a lot more uses than a blanket and so much easier to wash. Thanks for the idea!!! I think I'll pack both. I've kept beach towels in the car before, but my little fleece blankets are so much cozier! I buy two yards of fleece from the fabric store when it's on sale, and bingo! It's a blanket. There are so many different patterns, and my kids love picking out new ones. Thanks for the reminder! I keep a couple of those Gymboree baby blankets and some fleece blankets in my car, but I'll add some beach towels as well. Also, I'll have to watch that movie! We live in a veru rural area, so we travel alot to the city for various outings like going to the doctor, grocery shopping, clothing shopping, etc. We have two packs we keep in our car for emergencies. Remember to have a good flashlight. Breakdowns and accidents happen at night too. Flares are also a must on a dark rural road. Have a good pair of work gloves. Trying to change a tire in the snow is not easy when you cannot grip the tools. We keep a full change of clothes for each member of our family in the car and change them out each season. Have a good first aid kit with things like antacids, fever reducers, etc. Water! We keep several gallons in our car at all times. In the winter it will freeze, so we have to open it and pour out some of the water so that it won't pop the cap off. We also keep a roll of TP in our bag because we have needed it in the past. Because some roads into our area are very rural, there are not any alternate routes. We have been stuck behind accidents for hours and needed to find a private area behind a tree, lol. Those are all great suggestions, Jan. It's key that we think ahead and customize our preparedness according to our environment. The water stored in my Tahoe will come a lot closer to the boiling point than freezing! This is a timely article for me. Just finished getting the car checked for regular maintenance. Need to figure out where to store gas in our garage, and if that violates any apartment regulations. The cash advise is great, I usually carry some spare change, but not a lot of cash in the car, so I need to do that too. Thanks for the baby steps- this helps me a lot! I'm thinking that having enough cash to pay to fill up your gas tank, a couple of meals, and a cheap hotel might be a good amount to aim for. At the least, it would get you through a 24 hour period, possibly longer if you keep some food stored in your vehicle. Pilot bread, peanut butter, applesauce cups, jerky sealed in a Food Saver pouch are all good options. Heck, if you have blankets, toilet paper, and a shovel, you could save on the hotel expense. Whether on the road, hiking or at home, I organize survival by the following themes: Shelter, Water, Food, First Aid, Communications. The car is shelter (as are waterproof and temperature-appropriate clothes, hat and footwear and an AMK Heatsheets Bivvy). Carry water, always, and at least some energy bars and Gatorade powder (and think about your dog). First Aid kit. Also: fire-making tools (matches, firesteel, magnesium, "firestarter," hatchet, knife), "AA" battery cell phone charger and EXTRA BATTERIES, headlamp + flashlight (and EXTRA BATTERIES). I have a very spacious Honda Element in which I have two 99-gallon Action-Packers instead of rear seats so I have room for a lot and carry — at all times — all the usual road emergency gear (DUCT TAPE! Tire air compressor, heavy-duty jumper cables, extra fuses, strobe emergency lights) plus things like hiking poles, hiking boots, rope (tent guy line and/or substantial paracord), gloves, due-fuel Coleman one-burner stove. In addition to being prepared for being on the road when some societal calamity occurs, be prepared for the more mundane personal disasters — your car going off the road and out of sight and for losing all electrical power due to malfunction. Great topic, as always – thanks! Camping is great preparedness practice. And the reason I have so much "survival" gear to carry in my car. Survival Mom — if you haven't already, you may want to do an article on camping as part of preparedness. Camping is a fun, relatively cheap vacation as well as an opportunity to practice with the gear that will help you survive if an emergency requires sheltering-in or evacuation. I got into camping as an adult because I was looking for dog-friendly vacation options. A year into my gear acquisition, my city (Washington, D.C.) suffered a major ice storm, extreme low temps and rolling blackouts because the Northeast's power grid was overloaded. Suddenly the preparedness aspect of camping gear was loud-and-clear as I thanked God (Campmor, REI, LL Bean and Cabelas) for candle lanterns, sleeping bags, campstove, etc. I subsequently accelerated camping gear acquisition with an eye toward its preparedness utility. Sixteen years later and still camping (30-50 nights a year) and more prepared after every trip (I even keep a "teardrop" trailer in storage near the mountains where we usually camp — convenient, comfy and bonus: a preparedness asset). Every camp trip is survival practice. I agree – I just started camping in the last year, and I can tell you I would have done a LOT for some of the equipment I now have some years ago when I was stuck with no electricity for a week due to a snowstorm/ice storm combo. Love my coleman dual fuel. Two notes, implicit in your post: Practice is important! For the adults you'll refine and optimize your system each time. The first few times by A LOT. For the kids, if needed for an emergency, prior camping experience would make the whole thing much less of a shock. And it can take time for the kids too, I can tell you even after several outings, going through theory, tactical operations, and simulations (as well as "experience") my kids still have trouble "going" in the woods. UGH. I would hate to be dealing with that and all the rest in a stress scenario. – Flash light with extra batteries. – Car charger for your cell phone. Get an original one, often available for cheap on ebay, as no name products often charge tantalizing slow. If you live in an area with lots of water like streams etc., get a hiker's drinking bottle per 2 family members, and a pack of Potable aqua tablets (iodine-based, only 30 min wait but less healthy; or chlorine-dioxide-based, 4hr wait ). If you live in a rather dry area, store tap water in empty 2 ltr. soda bottles with 10 drops of E.D. Goodloe's Stabilized Oxygen. Replace once a year. 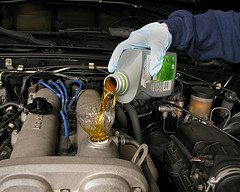 Can also come handy to replace coolant! If you have freezing temperatures in winter, fill only 7/8 of the 2 ltr. bottle (that's full less one cup), then squeeze the bottle and screw down with no air pocket in the bottle. As water when freezing expands by a bit more than 10%, the bottle should still not burst open in winter (worked for me so far). But still store in a space in your trunk where neither the expansion nor possible leaking water can do any damage. – If you have harsh winters you also need blankets or even sleeping bags with appropriate temperature rating, plus mini stove and a pot to melt snow. Vehicle maintenance should include a few more items. Transmission and differential gear oil changes at recommended intervals, or MORE often if you carry loads, or tow. Belts and hoses checked /changed as needed. We have a few items in our vehicles in addition to the list. "Mainstay" lifeboat rations. I know rations were mentioned, but this brand is the best, and exceeds CG specs. A urinal for the gals… portable. Its "conforming shape" make it easier to use, and eliminate splashing out there in the boonies…. I always carry a set of valve cores for the tires and a small air compressor……too easy for someone to remove your valve cores and then your stuck. Finally someone is talking about having to “potty” when stuck on the highway for extended periods of time. I found a cheap $5 folding camp potty. I’m putting it in the trunk with my cars emergency bag. I read that someone took a plastic table cloth, cut a hole in the center, put that over their head and then used the potty. Setting it beside the open passenger door and then also opening the rear passenger would also give more privacy. Another item worth considering is an old mobile phone, in case yours is lost or stolen. Even without a SIM, most networks will permit calls to emergency services, so it’s more use in the car than in the back of a drawer at home.